View topic - WLA-DX for VSCode - Forums - SMS Power! I'm making a VSCode extension for WLA-DX. WLA DX syntax is not parsable by normal parsers currently. If the highlighter is just token based then that doesn't matter. If it's a real parser then it can extract macros and label names, for example - and it would be amazing if it could follow relative labels visually/on click/keystroke. 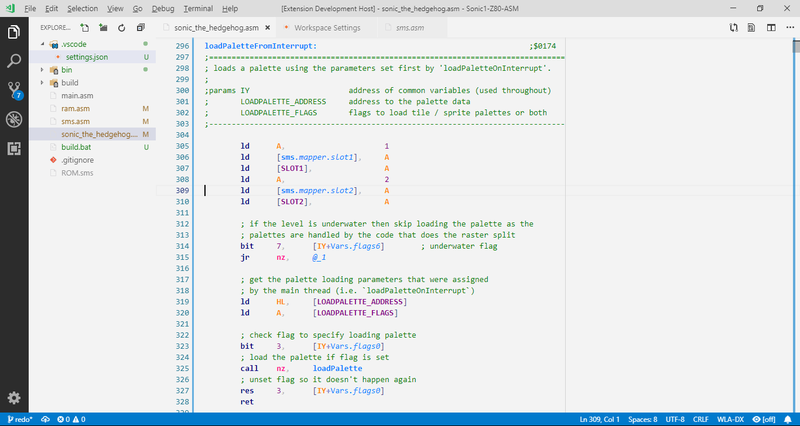 It's just a pretty dumb token colouriser -- it would take months to develop a real parser and everything and it's not something I'm capable of doing, but VSCode does support "language servers" to allow for full semantic understanding of code. Right now it's handling my 30'000-line Sonic1 disassembly just fine. I'll test your files out on it, always good to test with a different style of code. Personally I'm using a Notepad++ highlighter now - which is just token matching, bit I've configured it to try to pair begin/end directives which enables collapsing. I did try to also enable collapsing between push/pop - but that falls over very easily.